The Flats of Grand Traverse Bay and the surrounding shores of Lake Michigan have some of the best Carp and Smallmouth fishing in the State of Michigan. When one thinks of flats fishing, an image might jump into your head of clear aqua blue water and white sandy flats. Certainly accompanied by tropical weather and surrounding islands. 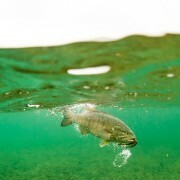 Here in Traverse City, on a hot June day, one might get that same feeling hunting the flats for Carp and Smallmouth Bass. However you are near the 45 parallel not the equator! 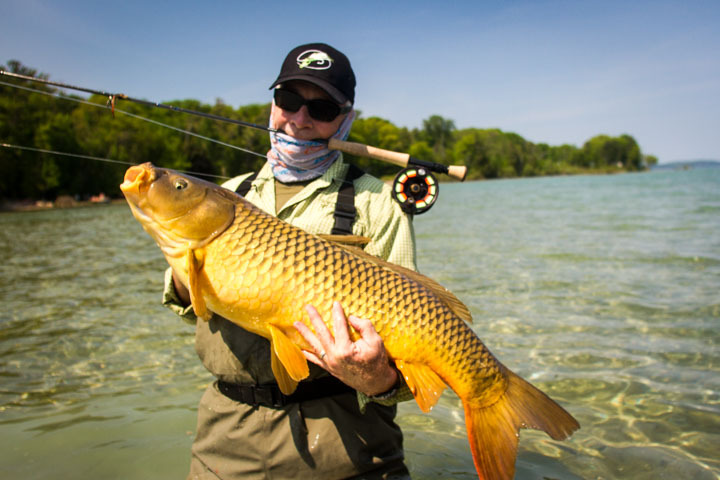 Traverse City Carp fishing is all about sight casting and stalking your prey. That is what drives us to the flats every year in early summer to hook into these Golden Bonefish and Bronzebacks of the Great Lakes. 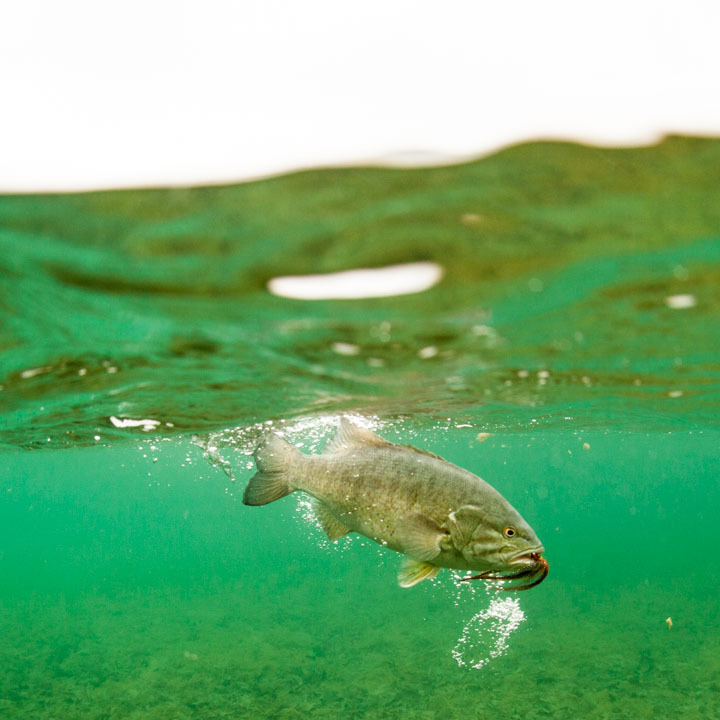 The flats surrounding Grand Traverse Bays offer great habitat for carp on the fly. Carp prefer shallow warm water for spawning and feeding and both bays offer plenty of habitat to hold good numbers. Muddy flats offer good spawning ground, and weedy shore lines and rocky bottoms hold the food source. There is a vast food source in the flats and carp feed on a variety of things, but mainly target only a few. Crayfish, leaches, and gobbies. Carp and smallmouth follow a water temperature timeline. They head to the flats every year in the Spring (Mid to Late May) to find warmer water, eat and to spawn. They then stay around for a post spawn feed until water temps force them to deeper cooler water (Mid to end July). Carp spawn anywhere from 60-70 degree water and smallmouth target that 65 degree water temp. Muddier flats are great carp spawning ground so fish key in on these areas. Deeper cuts leading to shallow water are basically highways both these fish use to get to shallow water safer. Shoreline weed beds are great feeding and spawning areas as they hold bait and structure needed for spawning. Smallmouth love that structure so look to boulder gardens and any other kinds of structure (docks, mouring bouys, and hoists) as they have great cover for spawning and ambush points. There are a few go to bugs that you need to be successful. Both carp and smallies love crayfish, it is a huge staple in their diet so make sure to have plenty of weighted and unweighted patterns based on water type. Leaches are a great early season pattern as there is not a ton of food out at that point and fish can be found more often in muddier flats early season where leaches are abundant. Round gobbies are another huge food source in the flats and a must have in the box. Other late season stuff that works well are twitch bugs and larger nymphs as food increases in the ecosystem. We are sight fishing out there and most of what we are doing is casting to actively feeding or moving fish and fish on structure. Casting to any moving fish is a challenge by itself, but being able to read whether or not it is a feeding fish and will eat is a big key to success. Look for quick erratic behavior, like fish darting in different directions. This is the pattern which they feed. Carp are bottom feeders and go mainly by feel and vibration. Smallmouth are opportunistic and ambush feeders; they will follow feeding carp pods and pick off stirred up bait or ambush baitfish or crayfish off structure. A good pair of waders and wading boots is important because you will be walking a lot of miles, so being comfortable out there is key. 7-8 wt rod and reel paired with a floating line is all you really need. 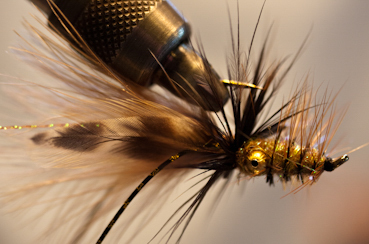 Orvis makes a few specialty lines that work great for what we are doing. (Hydros Carp Line). Good quality pair of polarized sunglasses for spotting fish, because spot and stalk is the name of the game on the flats and a decent pair will help improve your sight. Costa Del Mar has some awesome lenses for multiple scenarios, I prefer the green mirror with copper base for a bit more high contrast in the typically high sunny weather while we are on the flats. Hip pack or backpack to carry your extra gear. (water, sunscreen, camera, flies, etc.) It is nice to be able to take a bunch of gear out because most of the time you are a long way from the truck. Flies in various sizes and weights. Sometimes you are targeting fish in 1-5’ of water and fly depth is very important. 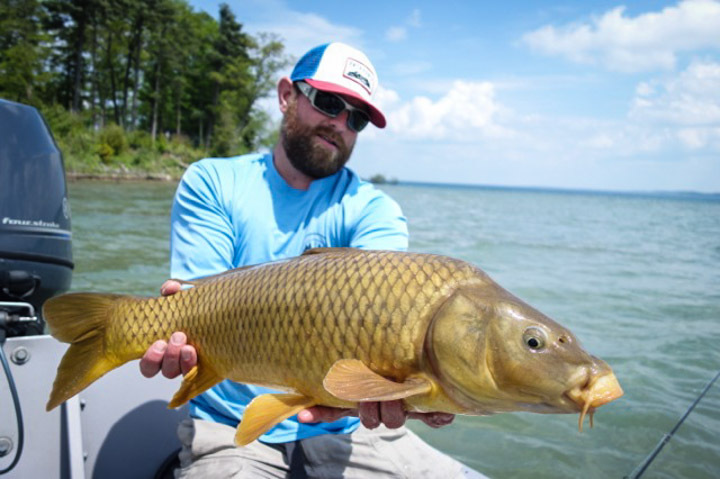 We love the flats game here in Traverse City, Michigan and have some of the best carp and smallmouth fishing in the country and we offer guide trips for both species as well as a Carp/Smallmouth on the flats school. 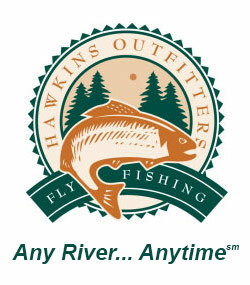 There are so many fun things happening this time of year and so many species to chase, Hawkins Outfitters looks forward to getting you out on the water and enjoy some of what Northern Michigan has to offer.